Perhaps being unable to take flight inspired man to invent the kite, treating it as a manifestation of himself in the sky. Yet, how did the much loved sport of making and flying kites reach the island's shores? Does a clue about the origin of kites lie hidden in the ancient Ramayana epic? Sadly, apart from this legend there is no record made of the kite's invention, introduction or even existence either in Sri Lanka's history books or its literature. There isn't even a known reference on as to how the kite came to be baptised ‘Sarungalaya', as it is called in the Sinhala language. If you take a stroll along Colombo's Galle Face Green in the evening, you will see first hand the popularity to which Sri Lanka's kite fever has risen in the months from July to September. If you travel through the villages, you will witness that the past time has spread to every corner in the country - as children fly their ‘Sarungalaya' whenever a fair wind blows over paddy fields and grassy meadows. Kite flying is more than a mere past time of delight in Sri Lanka today. 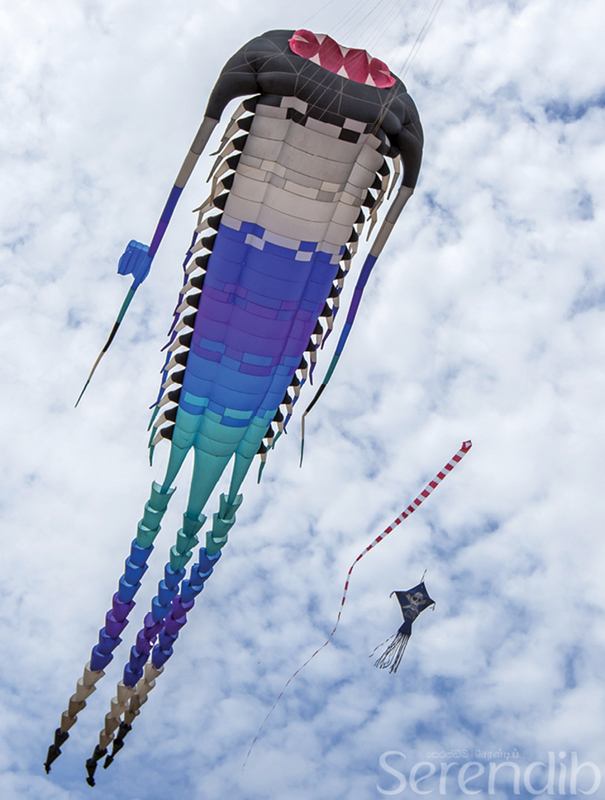 Every year in August or in September, the nation's Kite contest takes place and over a thousand people compete to win it. But the cup goes not to those who can merely make their kites fly the highest, but to those who can come up with an original design, a kite of a large size and ensure it flies. 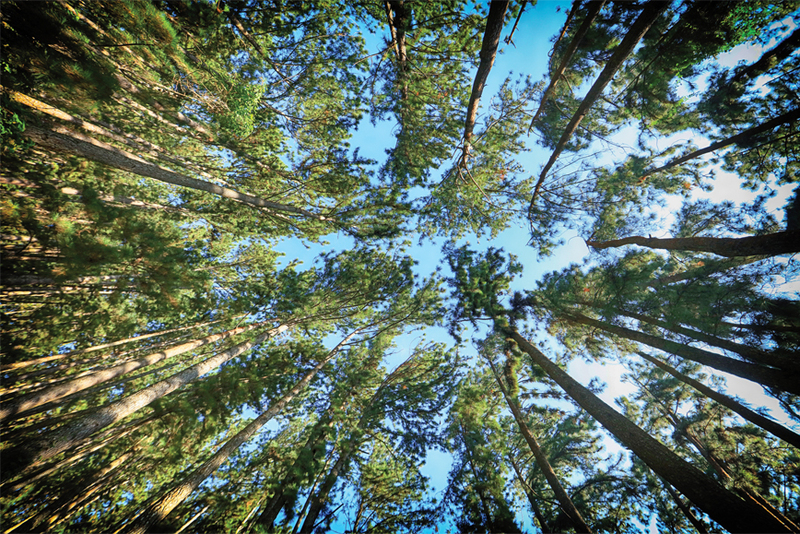 During some years the annual event called Nil Ahase Vasanthaya or ‘Spring in the Blue Sky' is held in Negombo as well. 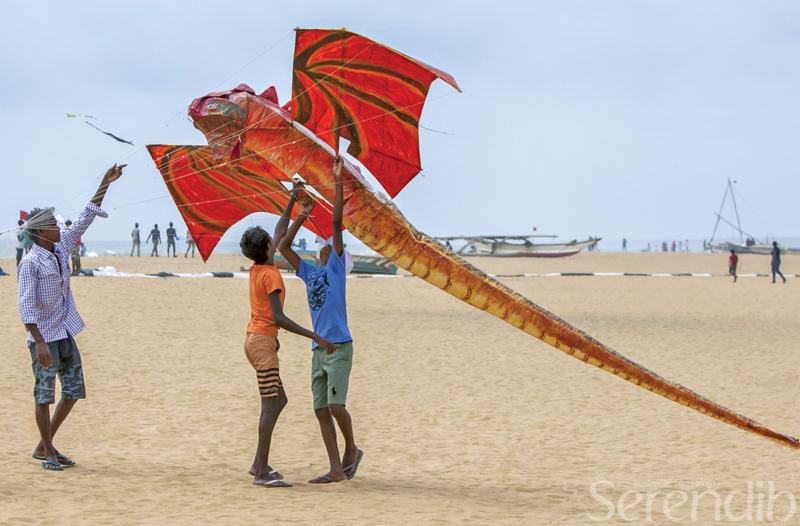 During these events of art in the sky, fire breathing dragons, galloping horses, flying birds, flapping bats, winging butterflies and even snakes with long tails dominate the sky above the Galle Face Green and island's beaches. For this brief period, these colourful drones in many guises rule, until a thread rewind or a lull in the wind make them come crashing down. 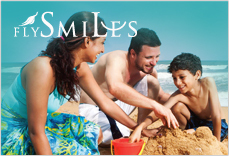 But from where or whom did the Sri Lankan's catch the infectious thrill of flying kites? The answer lies hidden in the legends of unrecorded history in vague references made to Greece and China from unauthenticated sources. Historians believe the kite was first invented between 400 and 300 BC by Achytes of the Greek city of Tarentum. He is said to have been a scientist who specialised in devising mathematical formulas on which he based his kite design. But the Chinese claim there was a history of kite flying even before 1000 BC in China, stating Chinese General Han Sin had kites in his arsenal for war in 205 BC. Kite flying is more than a mere past time of delight in Sri Lanka today. Though the true origins of the kite are lost in the mist of time, an ancient legend seems to suggest that perhaps the invention of the kite was made here in Sri Lanka over 7,000 years ago, though no exact period can be named. The first ever written instance of man traversing the skies in a flying object is recorded in India's epic 'The Ramayana'. 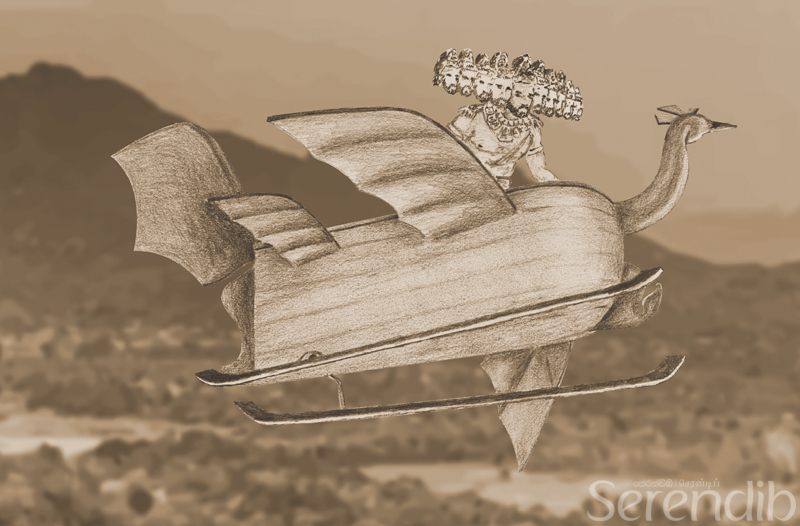 It records how King Ravana of Lankadweepa crossed the Palk Straits and invaded India by air in a flying object called the Dandhu Monara in Sinhalese or ‘Flying Peacock' in English. He is then said to have taken Rama's wife Sita hostage and bring her back to the island in his magnificent flying machine. Hence, if Ravana had a machine that could fly, surely the humble kite must have preceded the development of such a machine. 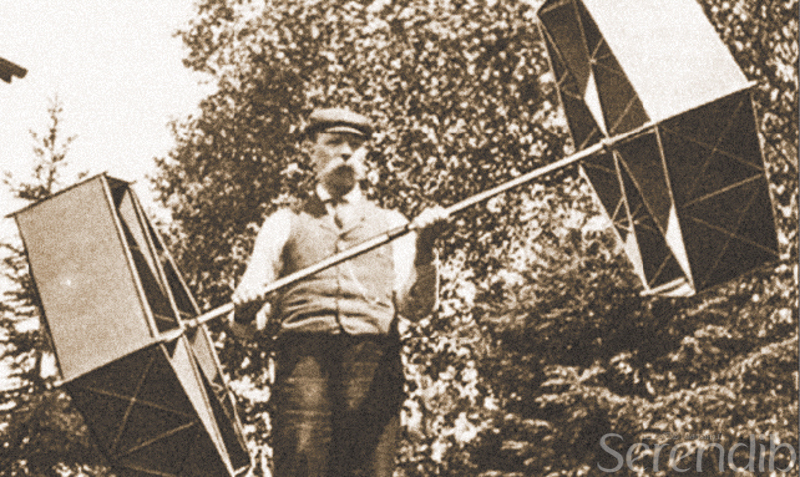 After all, in the last 200 years, before the invention of the airplane, several men have used kites in their efforts to design a successful flying machine. 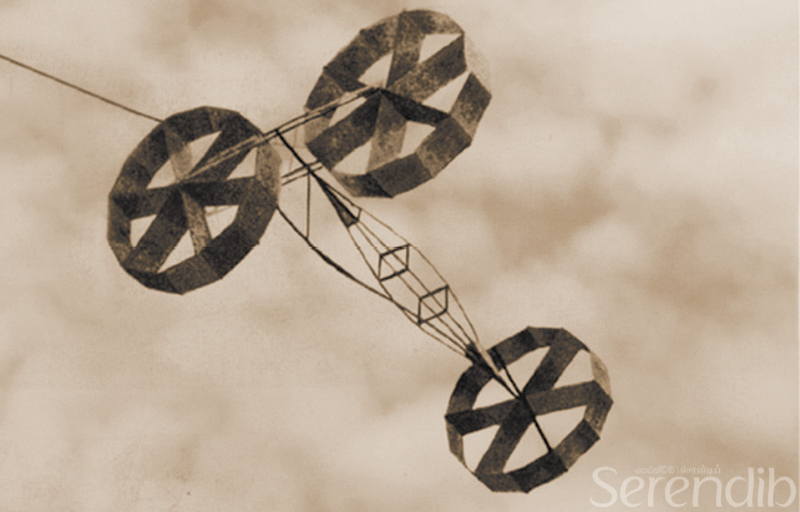 The Wright Brothers themselves first tested the design of the world's first airplane by initially test-flying a kite. While, Alexander Graham Bell, who made a large and improved Hargrave kite, which carried an army office of the USA to a height of 175 feet to test the efficacy of his new invention, the telephone. The claims of the Greeks and Chinese that invented the kite, may hold another clue as to how the kite came to the island's shores. Greece and China were seafaring trading nations and as Sri Lanka in the years both BC and AD was the Indian Ocean's capital trading post, the kites probably arrived to the island on Greek and Chinese ships. In terms of kite flying in Sri Lanka, history favours China. This is based on evidence that it was the Chinese who had spread the kite flying fever to neighbouring Asian countries such as Japan, Korea, Indonesia, Thailand and India. While in the past, kites were flown to record the temperature of clouds, prove theories on lightning and electricity, measure wind velocity and even to act as radar reflectors during World War II, today, kite flying is mainly for enjoyment. Though it is not known as to who introduced kites to Sri Lanka and when, kite flying is in the modern day, a popular passion and hobby in the island. 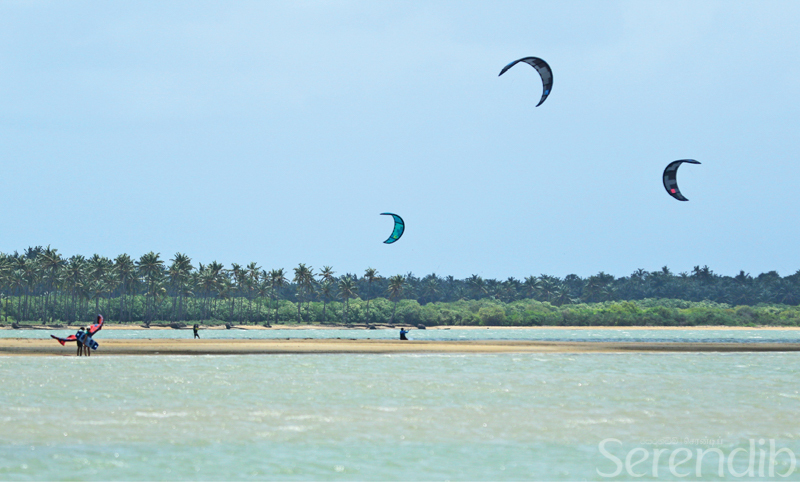 With the winds extending far along the western coast, kitesurfing has also become a popular sport in the Kalpitiya lagoon, Mannar, Bentota and is a sport that now even reaches to the Eastern shores. Professionals and beginners gather during the kite flying season to experience the exuberant thrills and spins of kite surfing.